Convicted entertainer Vybz Kartel told the police the whereabouts of several wanted men in Portmore, St Catherine and provided the authorities with information that led to the recovery of 17 illegal firearms. The move by the embattled entertainer was part of an effort to gain his freedom, or at least a vastly reduced prison sentence, the police said. He asked to speak with the commissioner who assigned a member of the high command to meet him and he offered information on wanted men in Portmore and also coughed up a number of illegal firearms trying to broker a deal to get the charges dropped. Kartel along with Andre St John, Shawn 'Shawn Storm' Campbell and Kahira Jones were all found guilty and slapped with life sentences for the murder of Clive 'Lizard' Williams, who police say was bludgeoned to death at a house in Havendale, St Andrew, on August 16, 2011. The men will have to serve 35, 30, and 25 years respectively if the Appellate Court throws out their appeals, which will likely be heard in a minimum three years from now, based upon the pace at which such appeals are dealt with. Police are also probing the disappearance of funeral home operator Jennifer Edwards, who went missing in January. The police said evidence was suggesting that Edwards was killed and her body disposed of as she had knowledge of sinister dealings relating to Williams' body. All four convicts are now being housed in a maximum security section of the New Horizon Adult Remand Centre on Spanish Town Road in Kingston Jamaica where high-risk inmates are kept at the State's pleasure. 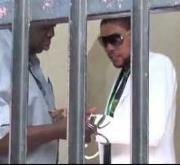 It has been said that Kartel was the boss of a criminal outfit that was responsible for more than 100 murders.